Mon­tre­al indie band Wolf Parade, found­ed in 2003 by front­man Spencer Krug after his time with Frog Eyes, released their third album, Expo 86, on Tues­day. 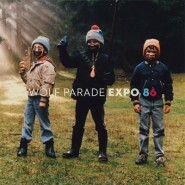 Expo 86 takes Wolf Parade’s eclec­tic sound and forms it into cohe­sive and, at least to some degree, inter­est­ing sound. Though Expo 86 suf­fers from some rather sig­nif­i­cant issues, in its strengths it still dis­plays Wolf Parade’s cre­ativ­i­ty. Expo 86’s open­ing track is, though dif­fi­cult to define, some sort of odd mix­ture of garage rock, punk, and met­al, plus key­boards. As inter­est­ing as that com­bi­na­tion may sound, it clear­ly wasn’t meant for mor­tal ears, as that track was eas­i­ly the worst on the album. Thank­ful­ly, not only was every oth­er track on the album bet­ter than it, every track was much, much bet­ter. Still, the album is far from excel­lent. Every sin­gle track seems to be per­fect­ly cal­cu­lat­ed to sound ama­teur­ish. Take a typ­i­cal track, for exam­ple, “What Did My Lover Say? (It Always Had to Go This Way).” The drums are always slight­ly too loud with their sig­nif­i­cant­ly too sim­ple lines, a per­fect repli­ca of, per­haps, a mediocre band that played at your high school tal­ent show; the instru­men­tals, though they nev­er stick with one line for long, are rarely actu­al­ly play­ing any­thing remote­ly inter­est­ing; and every melody and back­ing line on the album is so close­ly con­nect­ed that the band mem­bers are all but play­ing in uni­son. Fur­ther­more, it is almost impos­si­ble to tell what the over­all pur­pose of the album is. There doesn’t seem to be that much of a con­nec­tion between the tracks, oth­er than that they’re by the same band, and it’s hard to tell if the band real­ly knew what they were try­ing to do with Expo 86 oth­er than record some songs. As a whole, Expo 86 is a very whim­si­cal album (and not in a good way), which fur­ther con­tributes to the ama­teur­ish nature of the album. Spencer Krug pro­vides vocals to the album in a vari­ety of styles, vary­ing from open­er “Cloud Shad­ow on the Moun­tain“ ‘s near-yelp to the slight­ly plain­tive tone of “Oh You, Old Thing.” Krug’s styles gen­er­al­ly match the musi­cal theme of the giv­en track well. How­ev­er well they match, how­ev­er, Krug’s voice often sounds fair­ly over­stretched. Addi­tion­al­ly, the vocal melodies are so near­ly non-melodies that Krug’s voice is eas­i­ly buried under a few lay­ers of instru­ments. This is, how­ev­er, prob­a­bly for the best, as the instru­men­tal ele­ments of Expo 86 are sig­nif­i­cant­ly stronger than the vocals. Expo 86’s lyrics aren’t always the eas­i­est to make sense out of, but then, who’d expect that from a band called Wolf Parade, espe­cial­ly giv­en the album’s track titles? Instead, Krug sings lines like “I was asleep in a ham­mock / I was dream­ing that I was a web / I was a dream­catch­er hang­ing in the win­dow of a mini­van parked along the water’s edge.” This is, of course, odd enough that it’s at least a lit­tle bit inter­est­ing. Unfor­tu­nate­ly, though there are plen­ty of amply strange moments, there are an almost equal num­ber of over-repet­i­tive moments, which detract from the rather unique cre­ativ­i­ty Wolf Parade cul­ti­vates in its best moments. The final tracks of Expo 86 are a huge improve­ment on the rest of the album. “Two Men in New Tuxe­does,” the eighth of eleven tracks, is by far the most unex­pect­ed and inter­est­ing track on the album. It may not actu­al­ly be all that good a track on its own, but among the rest of the tracks it cer­tain­ly stands out. Wolf Parade also man­aged to break through the cur­rent norm of lack­lus­tre final tracks with “Cave-o-sapi­en,” which has a sur­pris­ing­ly excel­lent intro­duc­to­ry instru­men­tal sec­tion. Clear­ly, there is a sig­nif­i­cant amount of pleas­ant mate­r­i­al on Expo 86. In fact, the album’s biggest flaw is that it man­ages to make you want to dis­like it, even though the album is not actu­al­ly all that bad.